population pressure and a shortage of level land. 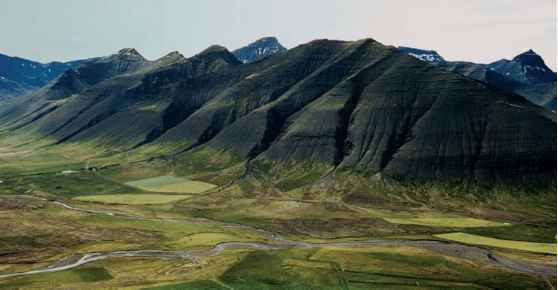 In highly settled mountainous areas one of the most sophisticated agricultural techniques is the use of terracing. It is often assumed that the terracing has been put in place with the sole purpose of reducing erosion. Terracing as developed in the Andes not only reduces soil erosion but serves also the equally important purpose of maximizing water use by the planted crops (Fig. 11.28). 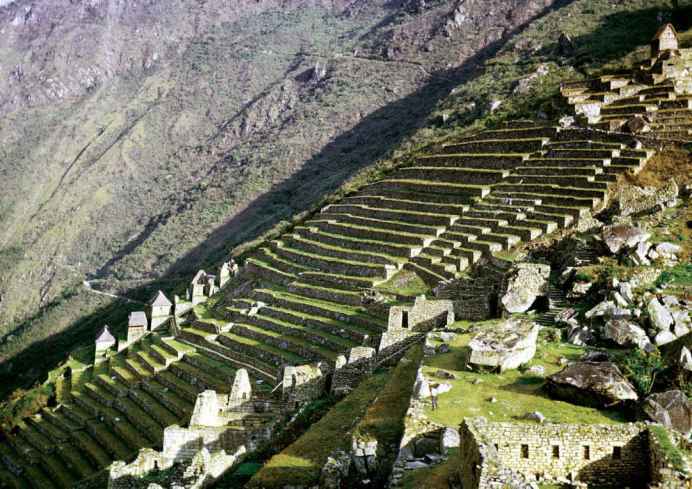 The use of terraces and irrigation for growing crops at high altitudes in the Andean cloud zone should perhaps be described as horticultural rather than agricultural. The terraces were not just revetments of the hillside but were specially constructed stone-lined troughs into which fertile soil was transported from the valley bottoms (Fig. 11.28). Fig. 11.29 Produce from a mountain farm in the Andes. 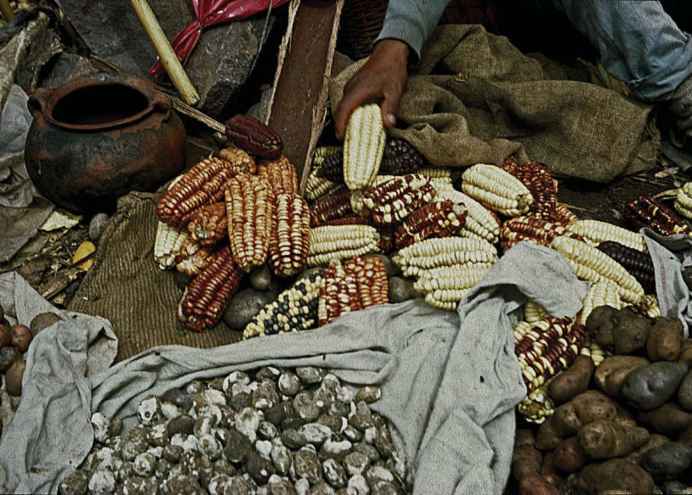 A farmer near Sicuani (Peru) with a collection of maize and various tubers harvested from his farm. Note the variation in the maize and tubers that come from his one farm. The unconscious selection of maize, a C4 plant with an enhanced carbon dioxide harvesting system and high water use efficiency, was a fortuitous event for Andean terrace farming (see text). terrace construction took various forms depending on the terrain. Small narrow terraces predominate on steep mountainsides but on the lower slopes where the gradient is reduced broad gently sloping terraces like small fields were still constructed with irrigation canals to maximize production. In the Andes precipitation is a limiting factor and the careful construction of irrigation canals over the centuries made it possible to grow crops further up the mountainsides than would have otherwise been possible. King, 1990). The highest cultivated plot in the world is recorded from near Lake Titicaca - a field of barley growing at a height of 4700 m (15 420 feet), too high for the grain to ripen but the stalks furnished forage for llamas and alpacas (www.crystalinks.com). Fig. 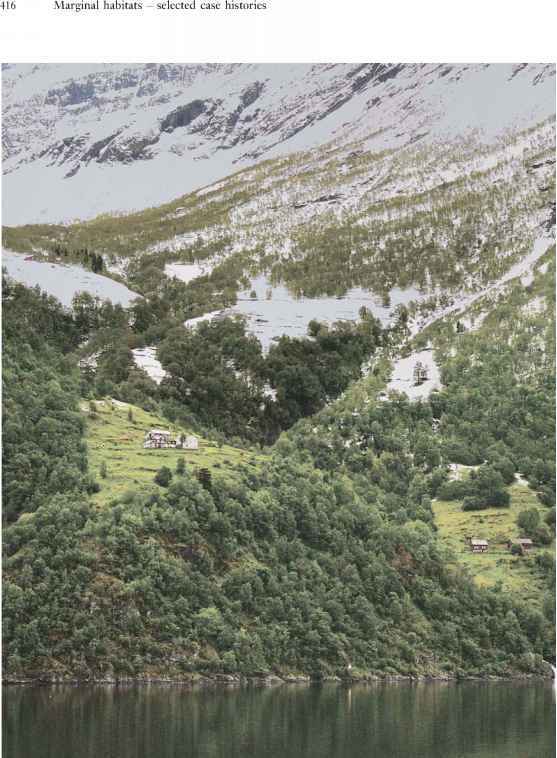 11.31 A marginal farm in early summer in the Geiranger Fiord, Norway. 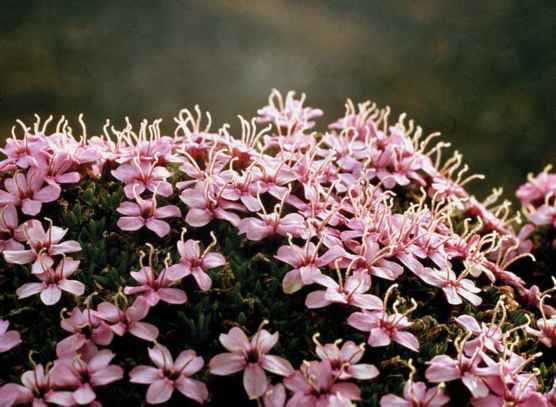 with 95% of the C4 species being found at altitudes above 3000 m (Wang, 2003).